Getting this message: Give your radio buttons the name attribute of indoor-outdoor. Each of your two radio button elements should be nested in its own label element. <-------- This even though my code looks identical to the solution videos code. Tried the help topics. So far hasn’t helped. Each of your radio buttons can be nested within its own label element. 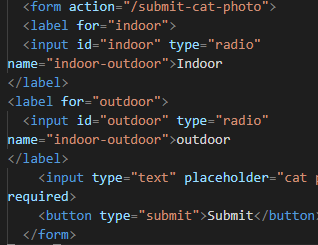 By wrapping an input element inside of a label element it will automatically associate the radio button input with the label element surrounding it. All related radio buttons should have the same name attribute to create a radio button group. By creating a radio group, selecting any single radio button will automatically deselect the other buttons within the same group ensuring only one answer is provided by the user. Add a pair of radio buttons to your form, each nested in its own label element. One should have the option of indoor and the other should have the option of outdoor . Both should share the name attribute of indoor-outdoor to create a radio group. Your page should have two radio button elements. Give your radio buttons the name attribute of indoor-outdoor . Just tested, it works just fine. Post your code so we can see it. Remember to format the code. This was frustrating me as well but i played around with it. Good luck… Im a beginner too! !